I’ve recently finished working on my latest mask – The Alchemist. 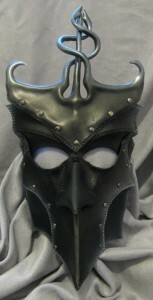 Based on the traditional Venetian Bauta mask with a Gothic twist, this unique mask is a private commission for Venice carnival 2009. The design allowed me to explore new ideas in leather mask-making, experimenting with rivets and hand tooling to create an exciting and different look. I’m really pleased with the result, and am definitely going to be designing more masks with tooling and rivets in the very near future. That design is utterly gorgeous!! i have seen some of your work ad its amazing. I was curious if one artist to another could ask some advise. I am looking to make a mask that i was going to rivet together i was curious if you seggest riveting and then molding or molding then riveting. thank you for your time.